That’s me, in the lovely dawn light, outside the virtual Cotton Club. Virtual Harlem (on the Second Life region of the same name) is as far as I can tell more a museum and educational thing than an operating living place (the thing with the words on it in the lower mid-right of the picture is a floating historical sign, and the trolley that goes around the place speaks a perpetual guided tour), but it has a few scenic spots, including the Cotton Club, the Apollo, the Savoy, and some nice residential streets. Speaking of which :) here’s the VAA posting about the 24 Challenge that I talked about here the other day, including nice pictures of all the entries. It’s sort of silly to be recommending something after it’s over, but WTH it’s my weblog, I can do whatever springs to fingers. 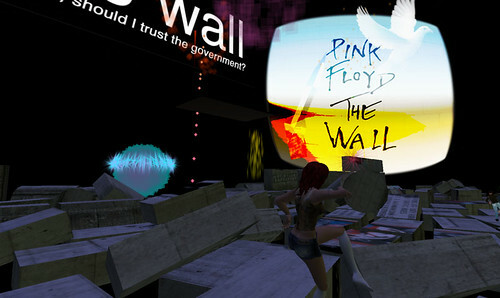 The other evening Phinn IM’d me to remind me that I kept saying I wanted to see the very notable “The Wall V-2” and well hey it was the last night so it was now or never, so I made room in my Busy Social Calendar and I went and it was really amazing and memorable and afterwards they invited us all to go up and dance on the fragments of the wall so there I am up there doing that. The whole thing was very very well done and highly effective. Lots of great scripted events, like shattering glass, entire-stage color changes (except, mostly, for The Wall itself, which sat there grey and graffiti covered and ominous), moving spotlights, character puppets, mostly sinister, that I couldn’t tell if someone was wearing or if they were being operated or scripted or what, costumed dancers, and generally all sorts of things. As well as disturbingly relevant Dubya voiceovers scattered through the soundtrack. Boy Dale is in the usual Naughty Designs Gabriel (Early Tan, Shaven) skin, and Diversity Hair. He’s now got one other skin and one other hair that he likes; I should take a picture in those sometime. Nice fishnet top and ankh pendant from I forget where. In some random Group IM the other day someone mentioned having heard something from a Linden, and someone else expressed amazement that a Linden had actually talked to someone, and said “are they still even on the grid?”. The answer is yes! Lindens are all over the grid, and while they’re often invisible and/or very busy (as when they’re fiddling around trying to keep things working, or fix problems, or investigate griefing complaints), there are also times when they’re just sitting around waiting for Residents to wander over and say Hi and talk about stuff. Some of these times are official Office Hours, lots of which are listed on the Wiki page of the same name. That’s Leyla Linden (the girl with the enthusiastic hair) and Whump Linden (the lil cyborg) in the foreground, and some boy’s back and me (the redhead in the center), at Whump’s Office Hours yesterday. Office Hourses vary wildly in style, scope, crowdedness, and interest. Anyone looking at the transcript of the session pictured here might conclude that we spent an hour on saying Hi, engaging in pointless chatter, and exchanging about eight sentences of actual information. They would be entirely correct. :) I missed Zero Linden’s office hours on Tuesday, and in looking at the transcript afterward, I was glad I did: fifty-five minutes of saying Hi and making silly jokes about obscure computer languages, and maybe five minutes of actual substance. On the other hand some other Zero and Whump office hours have actually delved rather deep into actual technical and design and architecture topics, the last Blue Linden office hours that I was at had lots of interesting discussion about Main Grid and Teen Grid issues, and once when I went to a Kate Linden office hours I was the only one there, and we spent awhile (I didn’t try to keep her for a whole hour) talking about Second Life in general, what it’s like to be a Linden, and so on. That was great fun. So Lindens are out there, and they’re approachable and free. Go to an office hours and grab one for yourself today! 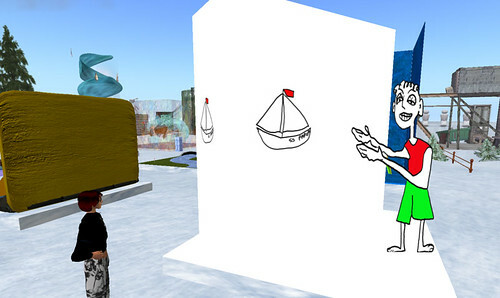 The Virtual Artist Alliiance had a 24-hour challenge, in which each artist had 24 hours to build a work of no more than 24 prims, based on a haiku: “Further up the stream / some children very busy / paper boats pass by”. This is my entry. It didn’t win, but I like it alot! The suggestion to use a simple childlike theme, and to have some of the boats be kites, were from Michelle, to whom this piece owes alot. It’s very very pretty, radiating simplicity and a kind of purity while also (unlike mine!) being high-quality workmanship. Note the starry particles (which were stationary in the work; I really need to sit down long enough to figure out how to do that with particles!). The boats turn out to be coming from this boy, who is presumably further up the stream from the staring naked people. Is he smiling just because he’s happy to be making the boats, or because he’s imaging the discomfiture (or is it amusement?) of the naked people on the beach? I hear a rumor that there may be a “Judges’ Choice” award also, based on the opinions of a particular known group of people. The outcome should be interesting if so. Here’s a random little fun site o’ the day: slnamewatch dot com uses the Second Life API (or screen-scraping or something; I don’t know!) to keep track of the list of last names that are available to new Second Life residents. You can also sign up (via a Google Group) to get notified (at most once a week) when new names are added to the list, and you can look at a report for a particular last name (like say Innis) about how many people with that name there are, when that name was last available, and so on. The main use of this is clearly ego-surfing. :) I’ve also signed up for the group (we’ll see how long I stay signed up), in hopes that if they ever make my RL last name available (which is entirely possible although it hasn’t happened yet) I’ll see the notification and have at least a tiny chance of swooping in in time to get an alt with my RL name (how cool would that be? ).